Coca-Cola Great Britain’s ParkLives initiative encourages people across the UK to enjoy their local green spaces by providing thousands of fun, free activities in community parks. To celebrate everything that’s taking place around the country, we’ve put together a rolling diary of highlights. Take a look and come back for more summer stories! What ParkLives activities are happening near you? The ParkLives team in Newham are starting a new craze! Tag archery is a more extreme version of dodgeball, with foam tipped arrows and inflatable obstacles. Once you’re geared up with masks and helmets, anyone can play! Time Out London even came along to watch the team in action. Check them out demonstrating the new sport. Find ParkLives activities in a local park near you. At 18, Myke and Owen are the youngest of nine qualified skate coaches in Nottingham. Through funding from ParkLives Nottingham and The Renewal Trust, they’ve earned their Level 1 Awards in Coaching Skateboard Sessions. Now they’re putting their training to good use, working with ParkLives and Sheffield's #theoutdoorcity delivering free sessions to local kids. Join a ParkLives skate session in Nottingham. With skating joining the Olympics in 2020 and Nottingham being one of the original homes of UK skateboarding, where better to host a rad Park Lives skateboard session for women and girls? ParkLives' latest activity - herding geese! Stand-up paddle boarding and goose herding were talk of the town in Nottingham as the Park Lives team and TeamSup organised a one of a kind event. The ParkLives team in Dundee found a unique way to celebrate Love Parks Week and World Emoji Day - by cutting a giant heart-eyes emoji in the grass at Dudhope Park! The Stoke-on-Trent ParkLives team and members of the army joined forces to dance the Macarena at the Armed Forces Day celebrations in Queens Park. There was a brilliant turnout in Newham as well, with the ParkLives team running 4 hours of yoga in East Ham Central Park. A total of 50 people, including families, young people, older people and adults, took part in Family Buti Yoga, Boxing Yoga, Hatha Yoga and Meditation Yoga throughout the day. The warm, sunny weather was perfect for relaxing in the park and the team set up shop in the shade of the trees to keep everyone cool. Yoga is a fantastic activity for improving your strength, flexibility and harmony between mind and body. Swansea ParkLives played their part for International Yoga with two special community sessions. Photos: International Yoga Day with ParkLives all around Britain. The Zumba ladies from the Bucknall and Tunstall classes in Stoke show their love for Parklives! Session leader Laura Gligan shares her top tips for making sure everyone at her Manchester health walk sessions has fun. Table tennis, Zumba, archery and Tai Chi. The ParkLives stand was a hit at The Lord Mayor’s Show – we caught up with the team after the event. The ParkLives session leader of the month for June is Angela Pepper from Stoke-on-Trent. Angela is involved in several activities, including Zumba and the Active Parent and Toddler group. She’s a brilliant source of inspiration, motivation and support. Last month our charity partner StreetGames was busy launching its programmes in 35 towns and cities across the UK. 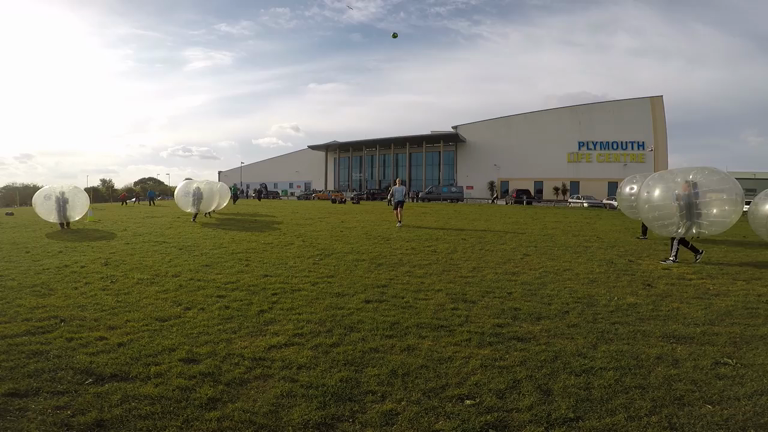 As well as classic sports day games such as tug of war and relays, the Plymouth team had a go at bubble football – a new activity that combines the beautiful game with zorbing, where footballers play a match wearing individual inflatable bubbles. Every month, ParkLives celebrates the fantastic work of one of our inspiring ParkLives session leaders. This month, the winner is Mick Sherratt from Birmingham. Mick runs the regular Couch to 5k session and testimonials have been pouring in from people who have enjoyed his sessions. What are Mick’s top running tips? Ever fancied escaping the pool? An intrepid crew of open water swimmers have been taking the plunge at Colwick’s Lake in Nottingham.